Size: 7ft 11in x 5ft 1in (241 x 155cm). Antique ‘Jail’ Agra rug with all over large boteh design. These rugs were woven in the prisons of Agra, India during the latter part of the 19th century. This rug is a superb example with a very dark indigo ground covered in large boteh design, the boteh are in gold, green, aubergine and ivory. The border is a striking diagonal stripe design. 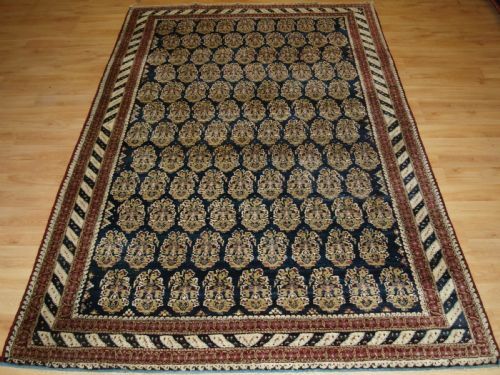 The rug is in excellent condition with almost no wear and full pile, the wool is very soft. The rug retains a small kilim at both ends in light indigo blue. It is rare to find such an outstanding example in almost perfect condition. Size: 8ft 9in x 5ft 9in (267 x 174cm). 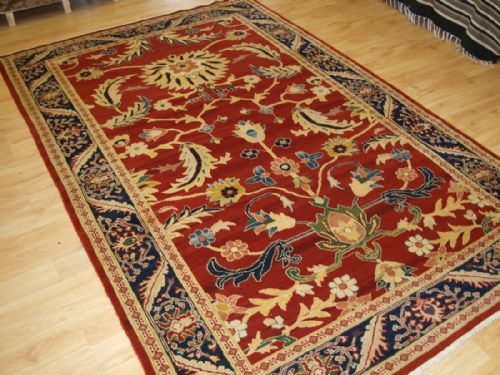 Old Ziegler style rug with large scale floral design on a red ground. A hand knotted rug probably of European manufacture. The rug is in good condition with slight even wear and good pile. Size: 6ft 7in x 4ft 3in (200 x 130cm). 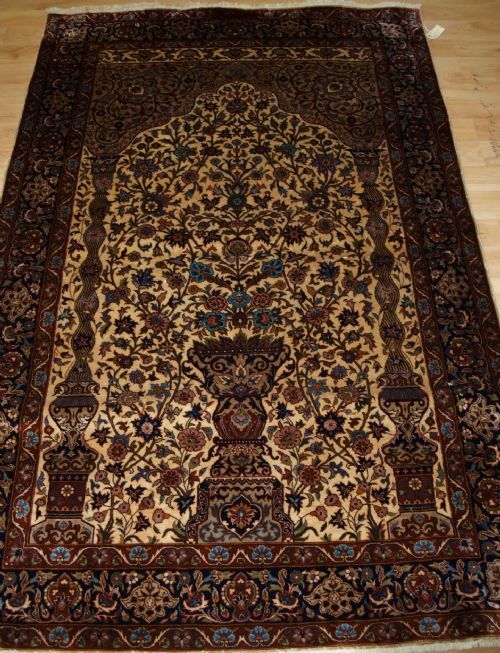 Indian rug of the classic Isfahan vase design prayer rug. The ivory coloured ground is covered with sprays of flowers growing from the vase. A good example of this classic design. The rug is in excellent condition with no wear and full pile. The rug has been hand washed and is ready for use. Size: 5ft 9in x 4ft 1in (175 x 125cm). 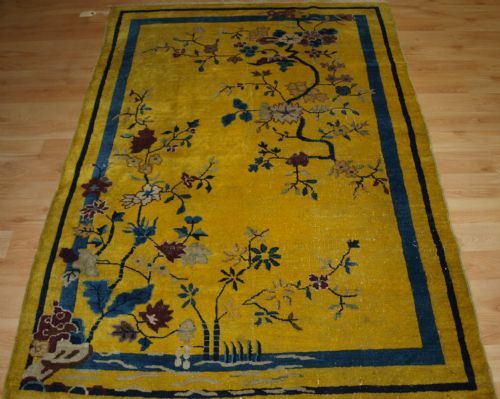 Antique Chinese yellow ground Peking rug. A striking rug with the classic Chinese garden design with trees in full blossom. The rug is in good condition with even wear and good pile. There is slight corrosion to some of the dyes. There are a few spots of local wear.